Home / School of Economics and Business Administration / Graduate Business - Ranked A Best Graduate School By U.S. News & World Report / M.S. in Finance / Why a Master's Degree in Finance? The benefits of Saint Mary’s Master of Science in Finance Program coupled with the opportunity to complete your CFA include: global recognition, practical skills, career advancement, and community. Attend class every Tuesday and Thursday evening from 6pm-8pm via Adobe Connect and every other Saturday on campus. Our curriculum focuses on the quantitative techniques used in financial analysis, including those required for all three levels of the Chartered Financial Analysis (CFA) exams. If you want to continue your education, your M.S. in Finance coursework will count toward a Saint Mary's MBA with a Finance concentration. This accelerated program allows you to earn an MBA by completing the eleven additional courses. 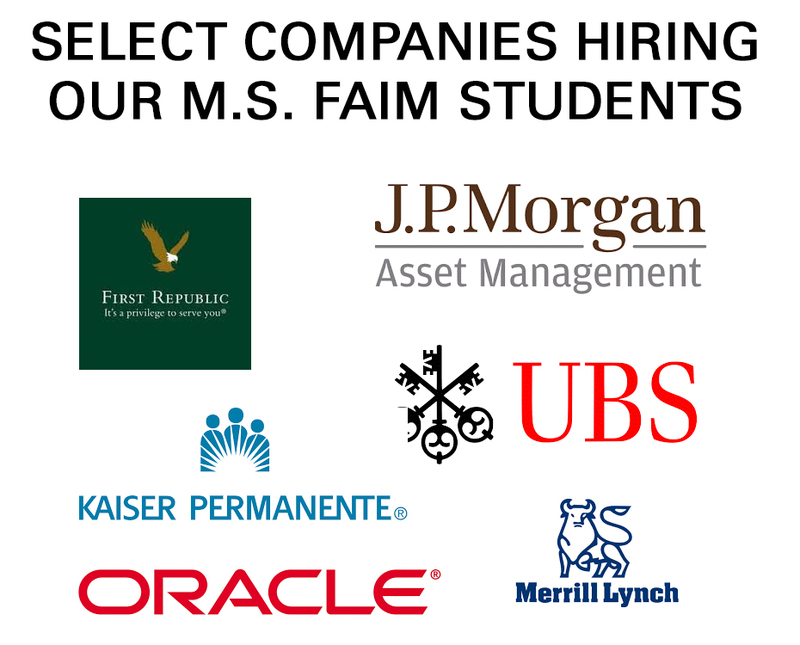 Our faculty includes some of the brightest minds in business today, including Saint Mary’s professors and outstanding professionals from the Bay Area’s investment community. Our small class size allows faculty members to be responsive and accessible between classes by phone or email. Enter the program, complete classes, and graduate with a group of approximately 15 working professionals with varied industry experience providing you with a valuable network of business connections and friendships.